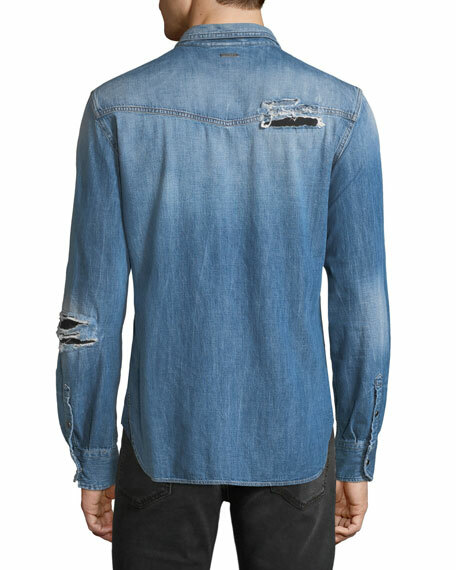 Just Cavalli western-style shirt in distressed denim. 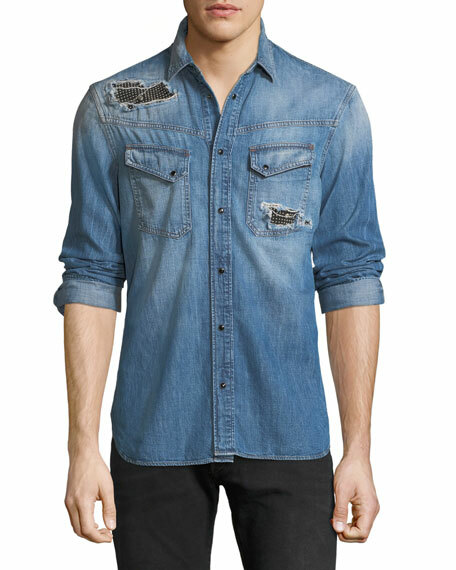 Brunello Cucinelli western denim shirt in leisure fit style. Spread collar; pearl-snap front. Double chest pearl-snap pockets. Long sleeves. Barrel cuffs. Shirttail hem. Cotton. Made in Italy. Model's measurements: Height, 6'1"/185cm, waist 31"/79cm, suit 40, shirt 15.5x35, inseam 32"/81cm. Calvin Klein 205W39NYC western-style shirt. Point collar; button front. Round barrel cuffs. Chest flap pockets. Shirttail hem. Wool. Made in Italy. Model's measurements: Height, 6'1"/185cm, Suit 40L, Shirt 15.5 x 35, Waist 32"/81cm, Inseam 33"/84cm. Culturata lightweight shirt in soft touch camouflage graphic design. Spread collar; button front. Short sleeves. Shirttail hem. Cotton. Made in Italy. Model's measurements: Height 6'1"/185cm, waist 32"/81cm, typically wears size M.